This study is based on early American newspapers from between 1764 and 1789 found in the Readex “America’s Historical Newspapers” collection. I searched for key terms relating to the rise in the separation of church and state sentiment at the time. Specifically, the main terms I searched for were: corrupt, state, episcopate, church, and power, in various combinations. This study focuses on the idea that as the fervor of revolution began to take hold of the colonists, the anti-establishment sentiment took hold as well, contributing to the sudden popularity of the idea of separation of church and state. A surprising aspect of this idea that I had not expected when I started this study was the dichotomy of the two sides who supported the idea. I recently had a wonderful conversation with two professors who work at the Perkins School of Theology about whether or not separation is still a relevant and hot-button issue for Americans today. They both thoroughly believed it is still one of the most important and divisive issues facing America today. They both agreed that the government is still imposing too much on the religious establishments with issues, specifically general hiring practices. However they differed in opinion on the righteousness of politicizing sermons to church memberships. I believe their opinions strongly reflect the divisiveness and complexity of separation that people face even within the same vein of thinking. This is relevance and complexity is what drew me to research the history of this topic, and hopefully to contribute to the open dialogue about these issues that has been sorely missing in our country in recent times. From the articles, there tended to be two types of people who supported separation: those who supported it to keep the government out of the church, and those who supported it to keep the church out of the government. However both sides had a common fear of misuse of power and corruption in both the state and church, and that fear brought them together to decide separation was best for everyone. The first amendment says “Congress shall make no law respecting an establishment of religion, or prohibiting the free exercise thereof,” and while it does not explicitly say the word separation in it, one of its biggest implications is separation, and it reflects the wants of sides of the separation movement. Many of the United States’ great founders were staunch supporters of separating church and state for the sake of the state. Most notably: Thomas Paine, James Madison, and Thomas Jefferson. It is an idea that these men helped carry the torch for, and it is incredibly relevant because we still struggle with many of the same issues today. My first data visualization is a word cloud consisting of some of the most popular single key terms that showed up in my research. The size and prevalence of each word determines the number of times it showed up compared to other key terms. As you can see, the most prevalent terms were church, state, episcopate, corrupt, power, and crown. I paired power and corrupt with state, church, and episcopate in different combinations to get a views from both pro-church and pro-state separitists. 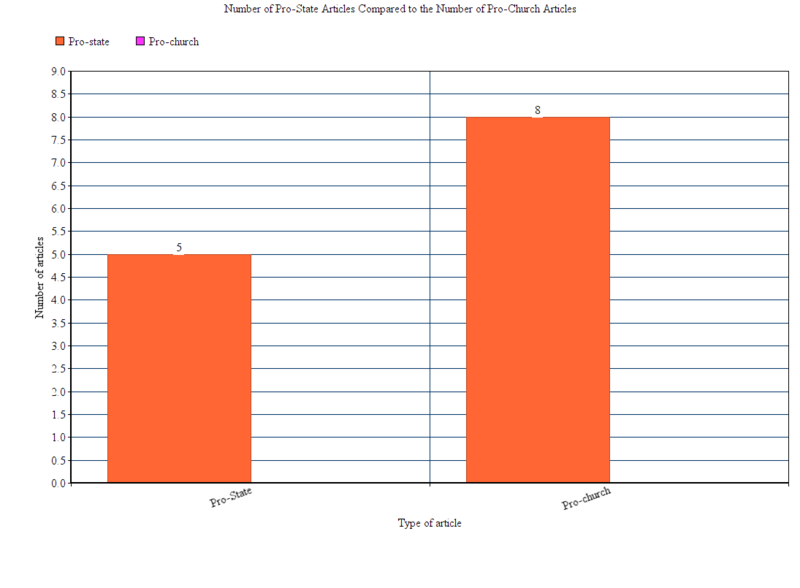 I found that the terms “church”, “government”, “corrupt”, and “crown” were the most popular in my articles. My second data visualization simply shows the discrepancy in how many more pro-church separatists were outspoken about their opinions compared to those who were pro-state, based on these texts. I found that historically, church supporters who wanted to keep the government out of the church were more outspoken and opinionated in news articles than those who supported separation for the sake of the government. I cannot account for this discrepancy, but I can speculate that it could be a result of the sheer number of outspoken and locally respected church leaders compared to the significantly smaller amount of government leaders at the time. Or it could simply be that church leaders were more afraid of government influence than government leaders were afraid of religious influence. Many arguments were similar within the pro-church separation movement. For instance the “The Centinel No. XVI,” published in 1768 by the Boston Evening Post argued that the civil government was exerting too much influence on the running of religious establishments. This was a very similar argument to that presented in “The Anatomist No. III,” published also in 1768 by the New York Journal, where the story of one “Mr. Brown” was used to show the problems some Episcopalians had to deal with when establishment was a part of the church. Other articles, such as “An Essay on Toleration and the Search After Truth,” published in 1767 by the Boston Post Boy, argued that even church establishment, such as an American Episcopate, inherently bred abuse of power and corruption even when good people are in charge. As far as the pro-state proponents of separation went, the opinions were somewhat less differing. Two good examples of this are an untitled article and “The Centinel No.1.” “The Centinel No. 1” was published by the Pennsylvania Journal in 1768, and discussed the dangers the power of the church in government posed to liberty. The untitled piece was published by the Pennsylvania Gazette in 1773, and was a response to the then governor’s opinion of the “heathen” natives and the common practice of politically powerful so-called “Christian princes” disseminating lands to people as they saw fit. These sides both feared what they saw as the establishment having too much influence in their worlds. This is where the fervor of the revolution helped promote the idea of separation. In texts from both sides, the main perpetrator of corruption either from the church or government was the English crown. To both sides, Britain’s religiously oriented government was the ultimate establishment, and had long served as a heavy-handed influence on both the government and churches in the colonies. While not explicitly stated by the authors of these examined texts, it becomes clear when looking at the mentions of British over-influence in many of the articles, that as the colonies became disenchanted with the rule of the British, they became disenchanted with the idea of corruption and miss-use of power in heavy-handed establishments., and a perfect example of this was when the powers of religion and government were intertwined. As a result the idea of separation became a perfect addition to the anti-establishment and anti-corruption movement that characterized the revolution, and my data supports this.